Cash Splash 5 is the 5-reeled version of the progressive cash splash game. Microgaming is known for its high paying progressive game and this one certainly falls under that category. Players will get to enjoy a fruit themed game that gives them plenty of winning opportunities through which they can claim a great amount of rewards. They can win these rewards whether through the line payouts, the progressive jackpot of the slot machine and the special features that the game has. 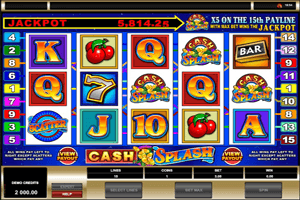 Play Cash Splash Slot here. Since the game is derived from its 3-reeled version, players can expect to see symbols that are inspired by 3-reeled slots. This includes bar symbols, cherries, sevens as well as poker card symbols and stacks of cash and gold. There is also the high paying logo of the game that awards players up to 6000 coins if they get 5 of these symbols on any of the paylines of the game. The Cash Splash logo is also the wild icon of the game as it can replace any of the rest of the symbols except the scatter bonus symbol. On top of that, this symbol has the ability to trigger the progressive jackpot of the game that can be seen at the top. That will happen when players get 5 logos on the 15th payline of the game while placing the maximum bet. There is also the bonus scatter icon that gives players generous scattered pays.